Greg Raths was elected to serve as a member of the Mission Viejo City Council in November 2014 and re-elected in 2018. He was selected by his council colleagues to serve as Mayor Pro Tem for 2015 & 2018, and Mayor for 2019. Greg is a long-time resident and homeowner of the City of Mission Viejo. He came to California and Mission Viejo in 1978 as a young First Lieutenant in the United States Marine Corps, where he was assigned to the 3rd Marine Aircraft Wing at the Marine Corps Air Station in El Toro. Greg is a decorated combat fighter pilot of Operations Desert Storm, Southern Watch, and Restore Hope. He commanded a Marine Corps F/A-18 Hornet Fighter Squadron aboard the USS Abraham Lincoln, a Marine Aircraft Group, and a Marine Aircraft Wing. 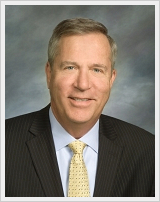 He served three years as Chief of Staff and Chief Financial Officer of The White House Military Office from 1996-1999. He retired from military service in 2004 at the rank of Colonel after 30 years of honorable service. After military service Greg flew as a commercial airline pilot with Jet Blue Airways, and later went into business as president of an automobile parts distribution company. He is also a publisher and author. Greg holds a MS Degree from National Defense University in Military Strategy, a BS Degree in Business Administration from Arizona State University, and a BA Degree from California State University, Fullerton in History and Political Science. He holds AA Degrees from Phoenix College and Saddleback College. Greg is a member of the Mission Viejo Rotary Club, Mission Viejo Chamber of Commerce, Mission Viejo Elks Lodge 2444, Mission Viejo VFW Post 6024, American Legion Post 291, St. Kilian Catholic Church, Assemblyman Bill Brough’s Veterans Advisory Committee, Councilman for the Orange Country Veterans Advisory Council, OSO Valley Greenbelt HOA Board, Knights Templar with the Sovereign Military Order of the Temple of Jerusalem, Knights of Columbus Council 6332, President of the charity Patriots and Paws, Association of Naval Aviation, Marine Corps Aviation Association, and UniteOC Toastmasters. Greg is married to his wife Luci. They have three children Michael, and twin daughters, Kristen and Kathryn. They also have six grandchildren; Julia, Katelyn, Sean MyKayla, Eric, Alyssa and Alyx. Mayor Raths serves on the 2028 Los Angeles Olympic Ad Hoc Committees. He is also the City’s representative for the League of California Cities and the Association of California Cities of Orange County.